1930-1941 Feat. Andy Kirk And His 12 Clouds Of Joy. Mary Lou Williams (1910-1981) was for decades often called Jazz’s greatest female Jazz musician, and by many said to be the “First Lady Of Jazz”. Duke Ellington called her “perpetually contemporary” and it was these two who were practically the only stride pianists to modernize their style through the years. She came to prominence in the late 20s and early 30s working with Andy Kirk and contributing arrangements to other big bands including Benny Goodman, Earl Hines and Tommy Dorsey. Going on to record for many labels including Decca, Columbia and Savoy, she appeared in concerts and Jazz festivals for the rest of her life, including starring at Benny Goodman's 40th anniversary Carnegie Hall concert in 1978, and on radio and television, including Sesame Street. 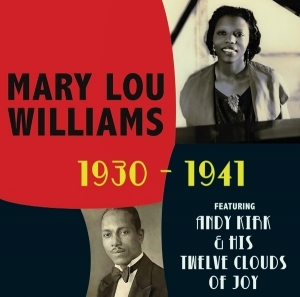 This album constitutes recordings from April 1930 to January 1941, with all but one recorded in New York City, with eleven of the tracks penned by Williams herself including ‘Twinklin'’. Other writers include Benny Moten and Fats Waller. From drums to tenor sax to clarinets to boogie-woogie bass this material was truly pioneering in its day. Listen to this album to truly appreciate ‘the lady who swings the band’.